After a long career in the finance sector, our dad, Martin, fancied a change so moved us all from Hampshire to Wilton, near Salisbury and ended up buying a market stall, called Sunrize Wholefoods, from an ageing hippy in early 1988. Immediately swapping the hesian sacks for new dispensors, the 1970's Leyland van to a new one and the stall for something which didn't fall over in the slightest of wind, he and our mum, Wendy went on a crash course about wholefoods, healthy eating and running a business. Luckily for us all, the pair of them were pretty good at it! 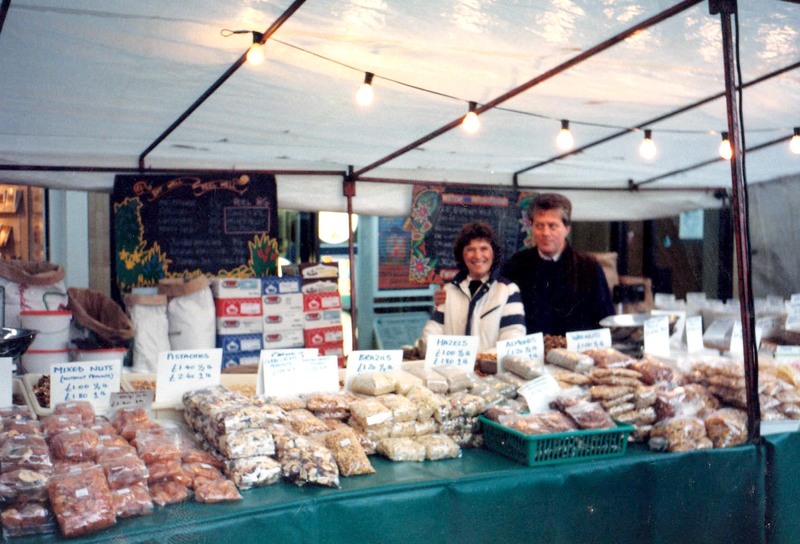 By the time Dan finished school in '91, the market stall had already trebled its takings and Martin knew the future was in pre-packing our products. So he and Dan set about installing our first ever production line in our new warehouse in the Wiltshire countryside. This proved such a success that the stall started visiting other markets and it wasn't long before we had our first trade customer. Growth continued apace and additional warehousing was acquired, branding developed, new markets attended and more trade customers served as Solomon joined the business after graduating from university in 1998. Working together for the first time, the family strove to improve their range of products and production methods and in 2004 moved into their present site in Downton, near Salisbury. With 3 automated packing lines, 2 semi automatic lines and 2 hand packing lines plus storage space approaching 10,000sq ft, we were ready to meet every new challenge. A good period of growth followed our successful rebranding in 2008, meaning that by the end of the year we were supplying over 200 independent stores across the South of England. Retailers and customers alike were easily able to recognize our strong Wilton Wholefoods Wholehearted Goodness and Sunrize Snacks brands, linking our heritage of setting up the business from our home in Wilton and Sunrize, the original name of the market stall. In 2009, Martin and Wendy decided to retire to the French countryside, so Dan and Sol were joined by Nicola, Sol's wife. Her professional background as a Chartered Accountant has become invaluable as the company continues its impressive increase in growth. This period also saw the introduction of our famous 'Value' brand, Sunrize Value, bringing price marked bags to the wholefood sector for the first time. With 2014 seeing another well received update to our Snack brand, Sunrize Snacks, we continue to invest and improve in our products, now supplying over 500 retailers, either directly or via our growing network of distributors. You can now find our products in Farm shops, village shops (including the 2015 Champion of Champions best village store in the UK, Ludwell stores), Community stores, SPAR stores, Londis stores, Greengrocers and Southern Co-operatives stores and of course on Salisbury Market. If you have your own shop and would like Sol to discuss how we can help you increase your footfall with a range of fab wholefoods, just click here for more information on Wholesale enquiries.